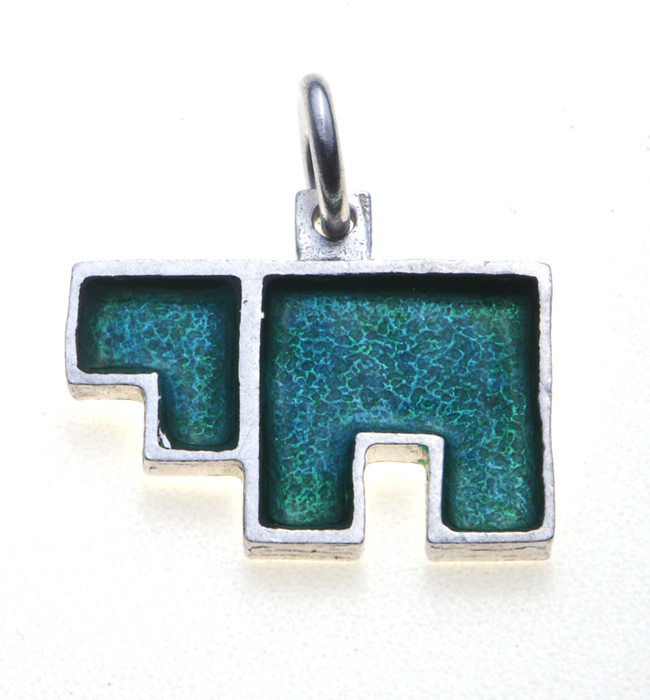 Idit Jewelry has updated the traditional chai (also spelled hai) pendant with this sterling silver and enamel version. Chai, of course, is the Hebrew word for 'life' and is represented by the number 18 in Kabbalistic gematria. Idit's sterling silver chai pendant necklace outlines the thick, sans-serif letters in silver and fills them with shiny enamel in either blue or turquoise. Blue-green shades are generally regarded as auspicious colors in Oriental countries, and many good-luck charms and amulets against the evil eye are created in blue or decorated with blue glass or stones. The pendant measures 3/8 inch X 5/8 inch (1.2 X 1.5 cm) and comes on either a 16 inch or an 18' (40.5 or 46 cm) silver chain. All of the handmade sterling silver jewelry in Idit's collection is created by hand by Jewish artisans in Israel. This jewelry makes a great gift for lovers of silver Judaica who have an eye for modern designer jewelry style.